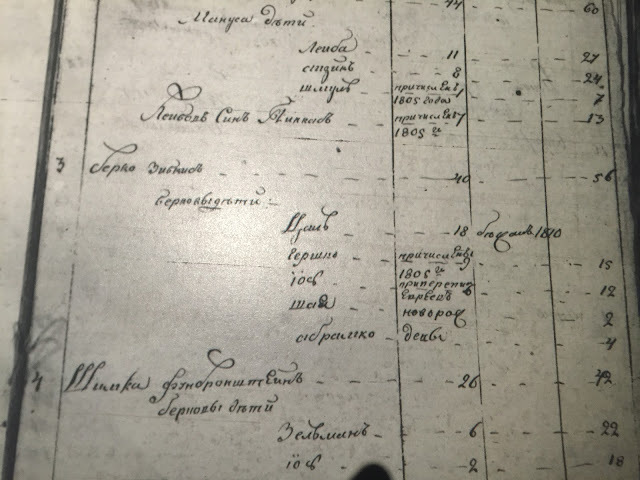 After discovering that the Zubata family from Buki (in the Uman district) could be connected to my Zubkis family, I ordered what was advertised on FamilySearch to be the "Uman District Revision List, 1811-1813." When it came in, I was disappointed to see how few pages there were (although a bit of me felt relieved that I wouldn't have to sound out very much Old Russian). There was only one family that looked like it might be a version of Zubkis, so I took photographs and uploaded it to Genealogy Translations. There, Inna, Jody and Natalia helped me to confirm that I was indeed reading it correctly--and may have gone back another generation. My gggg grandfather was Shaya Zubkis. Was this 2-year-old child my gggg grandfather? Maybe. But the names make sense. Shaya's son (and my ggg grandfather) was Shaul Ber. Could the middle name have been after Shaul Ber's grandfather Berko? My Shaya had a son Avram (possible after his brother Avramko), and Shaul Ber had a brother Yos. So was my 5th great grandfather (born about 1755!) Berko Zubkis? Well, I'm not yet sure. But I guess I'll need to look into more Uman-area records to prove or disprove that connection.